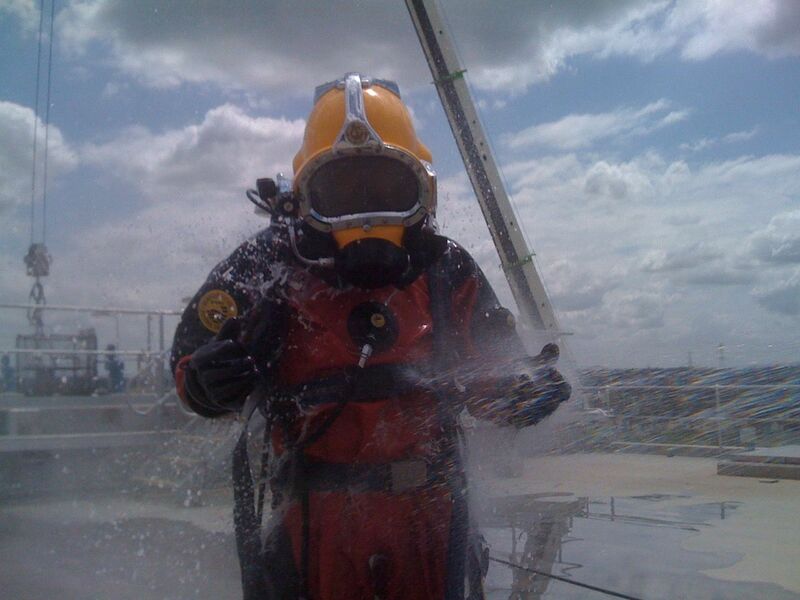 HD Viking Dry suits allow for diving in hazardous environments. We have used our suits in recycled water, raw sewerage, treated sewerage, and aeration ponds in abattoirs. 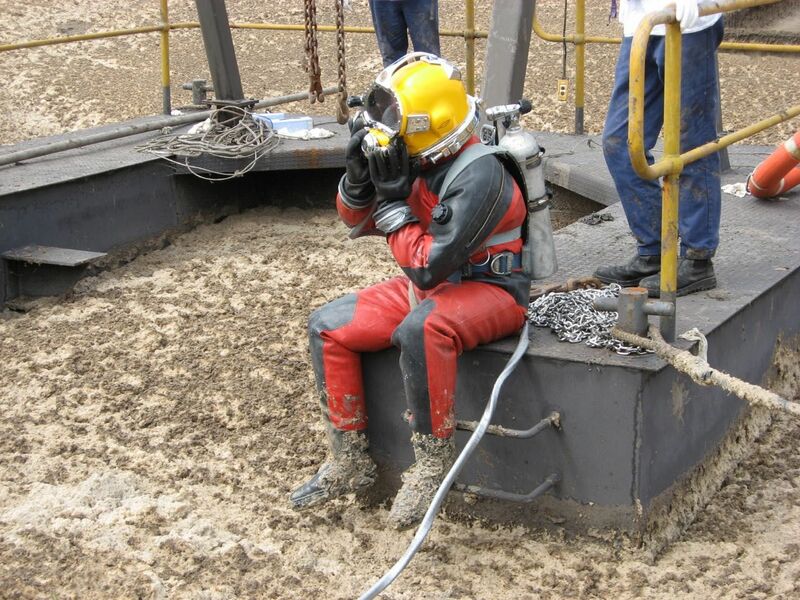 It is imperative when diving in contaminated environments, to use an appropriate dry suit, with mated helmet and gloves designed for this type of work. The best choice for this work is the HD Viking suit with bayonet locking gloves, and Kirby Morgan Dive Helmet. A diver retrieval plan and wash post dive should needs to be arranged before diving. 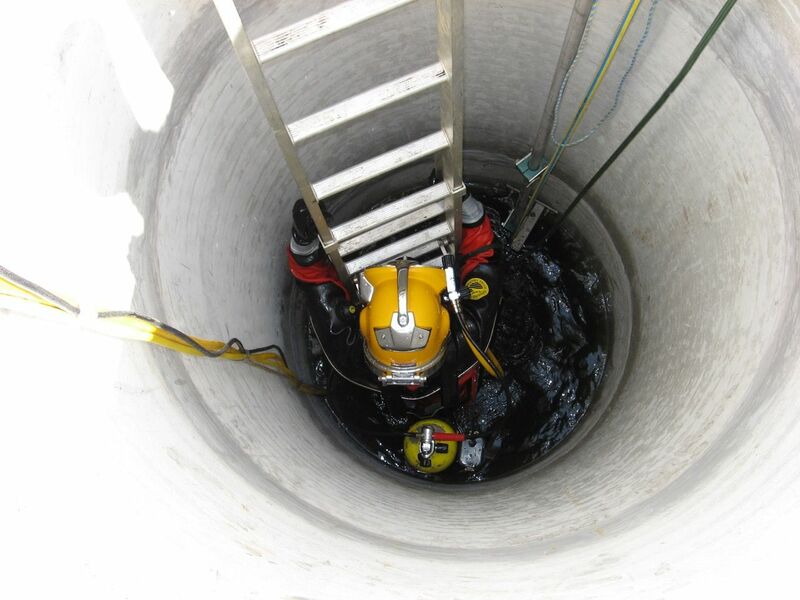 Sewerage diving allows the operations of a sewer treatment plant, to carry out work with minimal downtime. It is common for plants to be running at high capacity a lot of the time, and it is difficult to shut down long enough to carry out work. Using dives can mean no water needs to be offloaded, and only running machinery needs to be isolated. The cost of having a dive team carry out work in the tank, is often the quicker and cheaper alternative. The diver is protected by wearing a Viking Pro HD suit, which is hard wearing, thicker material, and designed for working in hazardous environments. Gloves mate to the wrist, giving a seal for the hands. If the glove does get damaged, water only enters the hand, and the suit is protected by a wrist seal. The helmet also mates to the suit, and a neck seal separates the suit again. The Viking suit also incorporates an inflator to allow the diver to out air into the suit as he dives deeper. We always run two complete suits with helmets, so the stand-by diver is able to dive and rescue the diver if required. Diving inside a pipe is an operation requiring some additional planning. 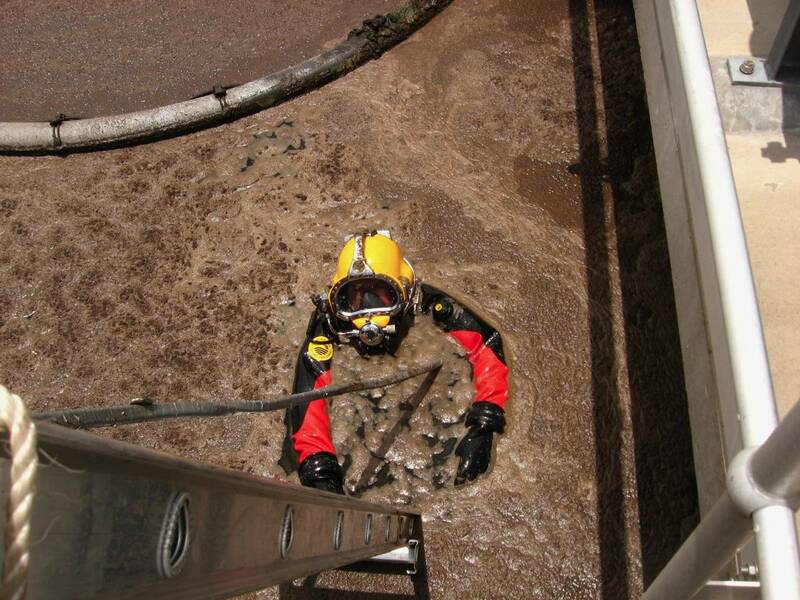 Diving in a pipe with contaminated water, requires a bit more planning again, but can be carried out safely given the right equipment and personnel. The diver always needs to have enough air to be able to independantly return to the surface. We always have additional stand-by air on the surface panel, as well as a larger emergency bottle on the divers back. 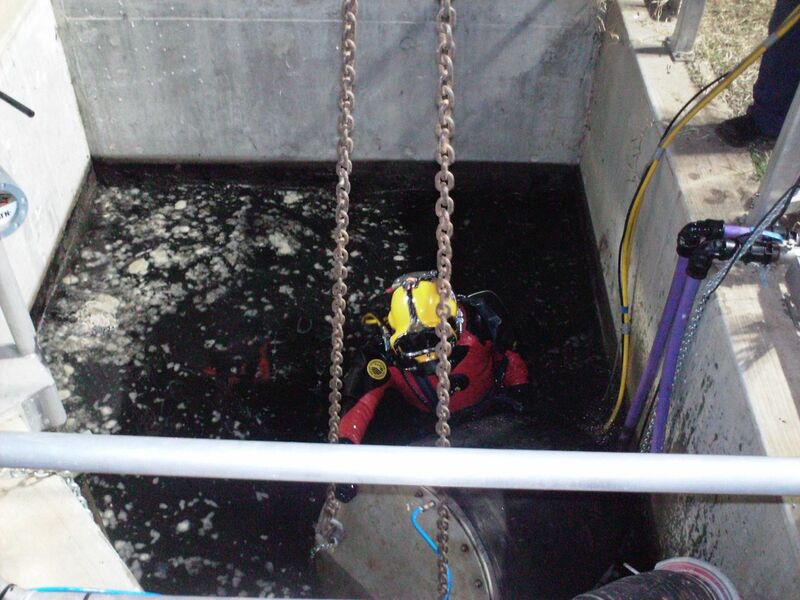 Pipe repairs and inspections can be carried out in pipework by our divers, with contamination suits and equipment. 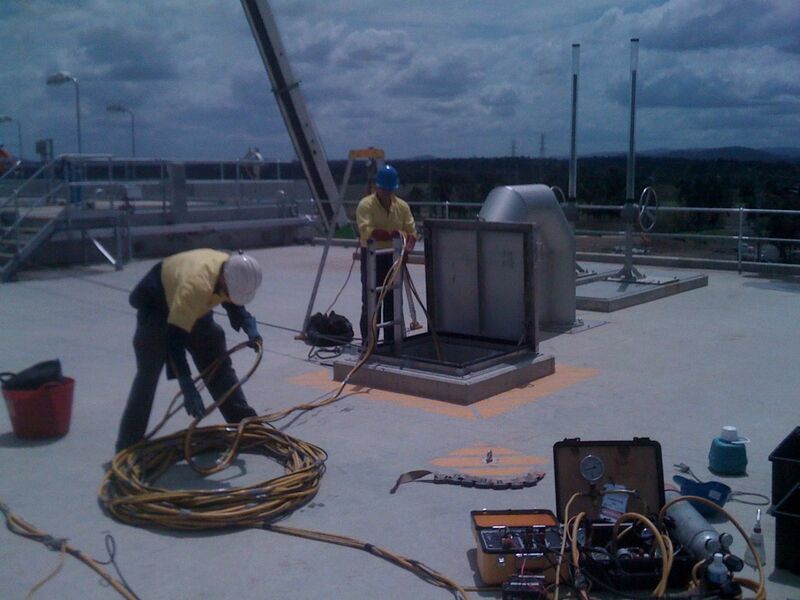 We clean many reservoirs, but we also keep a range of hoses, and vacuums for recycled water storage tanks. Queensland built a large recycled water network, which also needed maintaining. Using this equipment similar to reservoirs, and our sewerage diving dry suits and helmets, we have cleaned several recycled water tanks, with minimal disruption to the plants operation. If a valve or tank needs maintenance, our divers can plug a pipe, and reduce the amount of water to be transferred or removed, by hundreds of thousands of litres. A simple dive and plug install may be all that is required, to achieve double isolation, and carry out the work safely. We can also mate the plugs to our isolation plates, or use a plate instead. Either way, this service of plugging the pipe, allows easy work downstream, and minimal disruption.